ARTIFACT: Beautiful circa 1910 Horlick�s Malted Milk advertising celluloid pocket mirror. J&W Horlicks was started in 1873 in Chicago, Illinois by two brothers from Britain. The Horlick�s malted milk product was popular with the average citizen, but was also used to nourish babies, the ailing and even United States soldiers during World War II. The vibrantly colored design of the pin is a dairy maid with her favorite cow. The side of the cow reads: �ASK FOR HORLICK�S AT ALL FOUNTAINS AND HOTELS� and the maid is holding a milk container that reads: �HORLICK�S MALTED MILK�. The outer edge of the pocket mirror reads: �THIS MAIDEN FAIR WAS DRESSED IN SILK SHE DRINKS THE HORLICK�S MALTED MILK TEA OR COFFEE IT DOES REPLACE IN HEALTH OR SICKNESS, WINS THE RACE�. 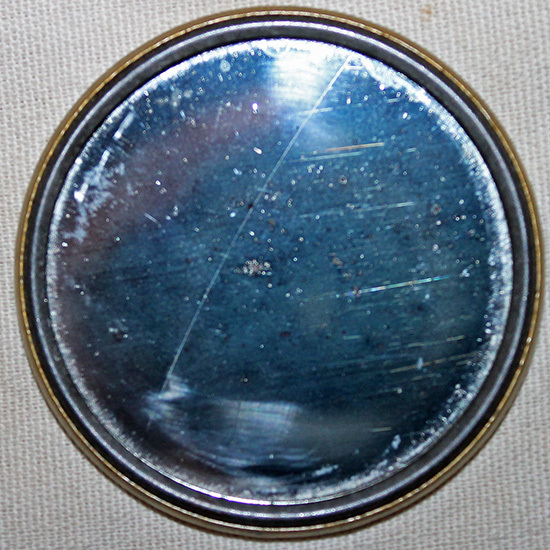 The reverse of the celluloid design is a round pocket mirror with a hairline crack that does not detract. CONDITION: 7 (Very Fine): The mirror shows minor to moderate wear, there is a hairline fracture in the mirror, but it does not detract, the celluloid remains vibrant and in nice condition.